Accounting is a discipline that provides financial and managerial information essential to the efficient conduct and evaluation of an organization. It includes the development and analysis of data, the testing of its validity and relevance, and the interpretation and communication of that information to internal and external users so that the users can make informed decisions. These business processes are accomplished using a wide variety of information technologies. Accounting is a multi-faceted discipline, which gives the student an in-depth working knowledge of the various functional areas of organizations including finance, information systems, human resources, production, marketing, and operations. The result is that graduates with an accounting education have a wide-range of future career choices in both accounting-related and non-accounting-related areas. g) determining the effective allocation of resources. An accountant is not an expert in all phases of accounting. Therefore, as their careers progress, many accountants specialize. Accountants may specialize in specific industry areas, such as medical services or manufacturing, or in particular professional service areas such as auditing, taxation, or business advisory services. During a career, many accountants broaden or change their areas of specialization and may make several career-path changes. They may change from one accounting career path (e.g., internal auditing, management accounting, government accounting, or public accounting) to a non-accounting career path or vice versa. An accounting education provides many opportunities for persons to take advantage of changing economic opportunities and organizational conditions. It provides a background for adapting to and making a wide range of career choices. Business Advisorv Services: engaged to evaluate the policies and procedures of organizations and to provide information to those organizations and their managements as to the ways in which the firms may more effectively and efficiently attain organizational goals and objectives. Forensic Accountants: engaged by and work with attorneys to determine the asset base of plaintiffs and defendants for purposes of prosecuting/defending in legal cases which range from personal litigation to corporate litigation. Forensic accountants frequently are used as "expert witnesses." Risk Management: consult with management to assess the risks of business interruption, risks of economic changes, security risks within the organization, and other types of risk assessment, including providing programs for business recovery in the event a problem should arise. The objective is to manage risks rather than reducing risks to zero. Auditor (independent or public) - obtains and evaluates evidence about an entity's financial statements and issues a written communication expressing a conclusion regarding these statements. Auditors are responsible for inspecting physical assets and documents which support accounting records and for making independent tests of business transactions. Auditors also perform verification work in areas not involving financial statements, e.g., verifying and reporting on the capabilities of specific software and the compliance with contractual agreements. prepares budget plans, plans for cash requirements, prepares market forecasts, and assists management in using the information to make effective management decisions. Certified Public Accountant - may perform one or all of the above financial services for an employer or client. A growing service area for CPAs is in non-financial services, such as compliance auditing (e.g., compliance with government laws/regulations and provisions of contracts), forensic accounting or litigation services, and general business consulting. Controller - directs the total accounting information system of a company and participates in strategic and operational planning. Cost Accountant - is primarily involved in determining the cost of a business' products and services and assists management in utilizing that information to make effective management decisions. General Accountant - performs some or all of the above functions (Le., auditing, tax, systems and procedures, cost, budgeting and forecasting) including the day-to-day work of keeping records, developing and supervising accounting practices and preparing special reports. Governmental Accountant - at the Federal, state or local levels, there are many accounting positions available. Positions are filled and promotions obtained often through competitive civil service examinations. Management Accountant - is member of the decision-making team of the organization. Work involves many of the activities of the "General Accountant." Operational Auditor (Internal Auditor) - performs various investigatory tasks for managements of organization to ensure that the policies of the organization are effective and efficient and have been properly implemented. The operational auditor also may perform various financial statement audit functions as well, including assisting the independent auditor in the conduct of an audit. The operational auditor is an employee of the organization for which he or she performs audit tasks. Systems Consultant - designs and installs accounting information systems for organizations. Tax Accountant - researches tax problems for maximum tax advantage, assists clients in tax planning, confers with taxing authorities on behalf of employer or client, and prepares tax returns. To achieve the highest level in your chosen field, you will want to complete the appropriate certification program. Here are some of the major certifications in the accounting profession. The CPA certification is the pathway to many professional opportunities--from chief financial officer in a large company to advisor for a small business. If you wish to have a career at a public accounting firm, you should become a Certified Public Accountant. In order to become a CPA, the student must: (1) pass the Uniform CPA Examination, administered by the American Institute of Certified Public Accountants on behalf of the California State Board of Accountancy, and (2) satisfy the experience and ethics examination requirements. For information on becoming a California CPA, visit http://www.dca.ca.gov/cba/. The Certified Management Accountant (CMA) program has been designed to recognize the unique qualifications and expertise of those professionals engaged in management accounting. This certification provides distinction in today's economic climate and certify your expertise in the business areas that are critical to the decision-making process. To become a CMA, you must: (1) pass the uniform examination prepared and administered by the Institute of Management Accountants (IMA), and (2) meet specific educational, experiential and professional standards. To get more information, visit http://www.imanet.org. Attaining the CIA designation outwardly signifies your achievement and commitment to the profession. Whether you choose to stay within the field of internal auditing or move up within your organization, the broad-based understanding of business, risk, and control required of CIA's will serve as an invaluable base of knowledge. The CGAP is a specialty certification designed specifically for and by government auditing practitioners. This certification program explores the candidates' comprehension of government auditing practice, methodologies, and environment, as well as related standards and control/risk models. To be eligible to sit for the CIA and CGAP exams, educational and experience requirements must be met. 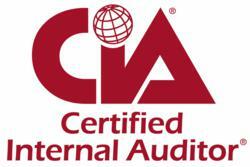 The Institute of Internal Auditors (IIA) is responsible for preparing and administering the CIA and CGAP exams. For more information, visit https://na.theiia.org/. Due to the versatile nature of accounting, persons with an interest in accounting need to develop their cognitive skills, as explained below. KNOWLEDGE: ability to remember previously learned material such as specifics, criteria, techniques, principles, and procedures (e.g., identify, define, list). COMPREHENSION: ability to grasp and interpret the meaning of material (e.g., classify, explain, distinguish between). APPLICATION: ability to use learned material in new and concrete situations (e.g., demonstrate, predict, solve). ANALYSIS: ability to break down material into its component parts so that its organizational structure can be understood; ability to recognize causal relationships, discriminate between behavior mechanisms, and identify elements that are relevant to the validation of a judgment (e.g., differentiate, estimate, order). SYNTHESIS: ability to put parts together to form a new whole or proposed set of operations; ability to relate ideas and formulate hypotheses (e.g., combine, formulate, revise). EVALUATION: ability to judge the value of material for a given purpose on the basis of consistency, logical accuracy, and comparison to standards; ability to appraise judgments involved in the selection of a course of action (e.g., criticize, justify, conclude). In addition to the cognitive skills, persons with an interest in accounting have to develop a number of other competencies including communication, leadership, decision-making, teamwork, technology, and willingness to learn. The focus of accounting continues to shift from a process of knowing to a process of having access to information and knowing how to use the information creatively to solve problems. The process in accounting education has been changed--from teaching to learning and thinking, and from passive learning (teacher-centered) to active learning (student-centered).